State nickname is The Volunteer State. State animal is the Raccoon. Deborah Adams: Jesus Creek Mystery Series: Jesus Creek, a small town in Tennessee, is the setting for this very unique series. Each book features a different character as the sleuth. Riley Adams (aka Elizabeth Spann Craig): Memphis BBQ Mystery Series: Lulu Taylor is the main sleuth and owner of a barbeque restaurant in Memphis, Tennessee. Jenna Bennett (aka Jennie Bentley & Bente Gallagher): Cutthroat Business Mystery Series OR Savannah Martin Real Estate Mystery Series: Savannah is a divorced, southern belle who is now working as a realtor (and sleuth!) in Nashville. AND Fidelity Investigations Mystery Series: Gina, the sleuth, lives in Nashville, Tennessee. Virginia Brown: Blue Suede Memphis Mystery Series: Harley Jean is a Memphis tour guide/sleuth. J. J. Cook (aka Joyce and Jim Lavene): Sweet Pepper Fire Brigade Mystery Series: Stella Griffin is the sleuth and current fire chief. Stella gets a lot of help from the ex-fire chief, Eric Gamlyn, who happens to be deceased! Vickie Fee: Liv and Di in Dixie Mystery Series: Liv McKay, a party planner, and Di Souther, her best friend, live and solve crimes in the fictional town of Dixie, Tennessee. Christy Tillery French: Natasha Chamberlain Mystery Series: Natasha is a bodyguard who works for Jonce Striker (the owner of the bodyguard company) in Knoxville, Tennessee. Susan Furlong: Bone Gap Travellers Mystery Series – Brynn is an ex-Marine who returns to Tennessee with her cadaver dog, Wilco. Jackie Griffey: Maryvale Mystery Series: Cas Larkin is the sheriff of this town in Tennessee AND Maggie & Joe Cozy Mystery Series: Maggie Murphy is a columnist/sleuth. Diane Kelly writes the House-Flipper Mystery Series which stars Whitney Whitaker, a house flipper in Nashville. Oh, and also, it stars Sawdust, her cat. Joyce and Jim Lavene (aka J.J. Cook & Ellie Grant): Taxi for the Dead Paranormal Mystery Series: Police officer Skye Mertz makes a deal with Abe to drive Abe’s Taxi for the Dead so that she can be saved from dying. Meg London (aka Peg Cochran): Sweet Nothings Vintage Lingerie Series: Emma Taylor has returned home to Paris, Tennessee from New York City. Molly MacRae: Haunted Yarn Shop Mystery Series: Kath Rutledge is the owner of a wool shop that has, as its tenant, a ghost. Mystery and the Minister’s Wife Mystery Series: This series follows Kate and Paul Hanlon (a minister and his wife) in Copper Mill, Tennessee. Several authors pen this mystery series. Delia Rosen: Deadly Deli Mystery Series: Gwen Silver (aka Nashville Katz) is the owner of a Nashville Jewish deli, and also a sleuth. Mary Saums: Willi Taft Mystery Series: Willi is not only a private investigator, but a Nashville singing sleuth as well. Hi Danna, The Blue Suede mystery series is set in Memphis. The author is Virginia Brown. So far, there are 4 books in the series: Hound Dog Blues, Harley Rushes In, Suspicious Mimes, and Return to Fender. Ms. Brown writes the Dixie Diva Mysteries, too. Thank you, Linda, I have added Virginia Brown to the Tennessee list. Sometimes I miss an author – or two – and I really appreciate it when people let me know. Thanks, again! Deborah, if Paris is the capital of Fish Fries, it sounds like my type of place! 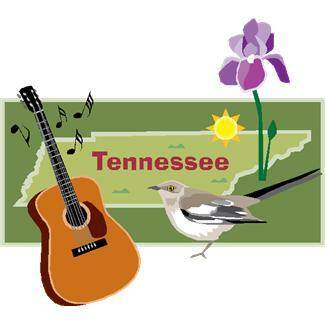 danna, I love Tennessee! it is such a beautiful state. Thanks for the list! I hadnt seen all of these yet. Have you seen the Inspector Constable books by Roger Keevil? He’s a British author who writes traditional Agatha Christie-type modern murders with a humorous take. He has fun with names – take a look and you’ll see what I mean. Thank you, Chris C, for telling us about Roger Keevil’s Inspector Constable Murder Mystery Series. Jane Sevier writes a series of historical mysteries set in 1930s Memphis, about a socialite turned psychic medium. Fortune’s Fool and A Billy Sunday Kind of Love, so far. Jaden Terrell writes a series of PI novels about a private investigator named Jared McKean in Nashville. Racing the Devil is the first, and A Cup Full of Midnight is the second. Chester Campbell writes a couple different series set in the middle Tennessee area. Too many titles to list here. JT Ellison writes a series of thrillers about a Nashville homicide detective named Taylor Jackson. Thanks, Jenna, for all of these Tennessee mystery authors! What about the Body Farm series, by Jefferson Bass? Partially authored by Dr. William Bass, former professor of anthropology at the University of Tennessee, Knoxville, the series is almost entirely centered in eastern Tennessee. Richard, thank you for telling us about this Tennessee mystery book series. Hi, I just came across this list while looking for books set in Nashville. I don’t know if you are still keeping this list up or not but you really should add the books about Harry James Denton – he is a private eye based in Nashville they are written by Steven Womack who did live in Franklin TN. There are 5 or 6 of them I think and they are amazing. I love the stories as well as being able to picture exactly where he is in Nashville just by the description of the area. Tina, welcome to the site! I’ll certainly take a look at them – though I will warn you that the list of authors I’m considering adding to the site is now very long so it might take quite some time!